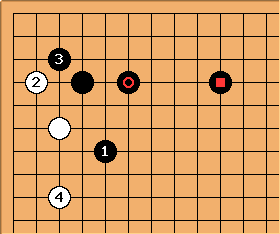 Preventing ponnuki - kikashi or bad play? SnotNose I noticed that in professional games ponnukis occur with surprising frequency, particularly in the middle game. What I mean is that when I review pro games, I often see situations in which I would play out of the atari of a single stone but the pro does not. Were it possible to search games by pros and amateurs and count ponnukis, I wonder if there are more in the former than in the latter. Or maybe it is a kyu/dan distinction. Bottom line: allowing a ponnuki is not automatically bad. As with many aspects of go: it depends on the situation. 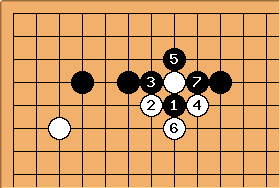 The value of a ponnuki depends on whether it appears in the fuseki, the middle game, or the EndGame. Usually the later the game, the less valuable the ponnuki is. The reason for this is that a ponnuki is thick, which means it is hard (or impossible) to attack a ponnuki. This is because ponnukis can easily be turned into living groups, as they have a rich potential for creating eyes. A thick shape has strong influence and thus a ponnuki can later be used for attack, for building territory, or as safe haven for retreating invasion stones. By now you should see why ponnukis are worth 30 points. tderz: time of occurence and place are important for the value. I.e. at the edge, the ponnuki will usually just be the exchange for capturing s.th. else or making a connection, but not have the surplus value of 30 points, cf. below (exempt for mistakes). BillSpight: I suspect that the 30 points in the proverb comes from the old estimate that a stone is worth 10 points. True, there are four stones in a ponnuki, but presumably the shape was formed by capturing one stone, which makes the net number of stones three. If no mistake has been made by the maker of the ponnuki early in the game, 30 points may be an underestimate. Black is obviously overconcentrated. Bob Myers: But this is not a ponnuki. It's just a diamond shape. What the proverb does is warn against this kind of thing. 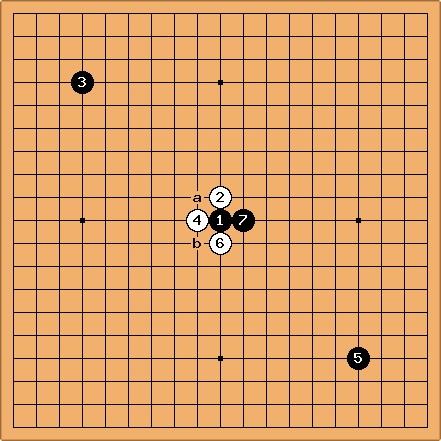 Black has connected, but at the cost of allowing a ponnuki. The ponnuki is stronger than it looks. 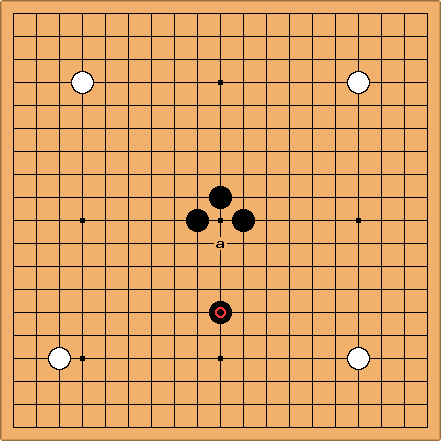 If we regard the three pairings / as roughly equal (although slightly favorable for Black), the ponnuki stone is almost a free move. Bill: You are right that White is in no hurry to fill the ko. By the same token, Black should be in no hurry to take and win it. If he does, White can regard the remaining three stones lightly. They become easy to throw away. While Black takes and wins the ko, White will make profit somewhere else. Charles Agree with Bill. 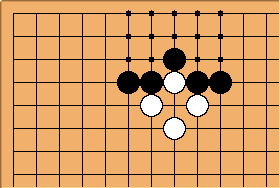 Black already has two stones more than White here (local tally BB, noting that one black stone has been captured). 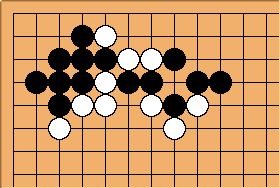 If Black takes and then fills the ko, that becomes BBBB. Sebastian: Thanks for both your replies. Bill's clarification that both are in no hurry shows that there is some temporary stability in the position, but I still don't see why the ponnuki is worth 30 points (or even anywhere close). Charles, I don't see how you get to BB. Taking the interloper as given is a convention (because the original context of "warn[ing] against this kind of thing" was examining Black's choices.) From then on the sequence is , , , , , , , which reduces to B. Or does local tally add special points for taking prisoners? Charles Yes - useless without that. Seven black, five white stones. Where are White's 14+30 points? Black has built a nice territory, so W has to have something in exchange, presumably it's influence. But White's shape is anything but an iron wall, and with 2 more investments (i.e. 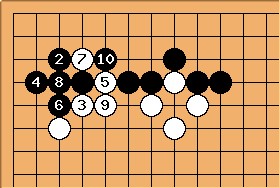 if W tenukis twice to throw away the stones), Black can crush White's influence. OTOH, turning this into solid territory for White takes probably even more local tally investments. Who can find the mistake in my reasoning? Thanks! Bill: Elementary oversight: To say that the White ponnuki is worth 30 points says nothing about how much the Black stones are worth. In fact, since Black has invested 6 stones to White's 4, you should expect Black to have a local advantage. Even though Black's stones are not as efficient as White's, I would expect Black's advantage to be at least 20 points. Sebastian: Thanks! Now I think I got it. So you could roughly say: If the ponnuki were not there then Black would have outside influence worth a lot, and with it it has hardly any - about 30 points less. Correct? Bill: Well, it isn't just that Black does not have a strong wall, radiating influence. White's ponnuki is strong, although not nearly as strong as a ponnuki standing alone. Also, such a comparison is in a way unfair to Black, who would not build such a wall except in response to White's plays. Tewari is the best way to think about these things. John F. It is my experience that this is one of the best benchmark positions around: understanding the explanation given (I agree with what Bill and Charles say) seems to be a sharp marker for a higher dan amateur. My experience is that even European 1-dans don't get it, but Charles has much more experience as a teacher. Charles: do you agree and if so at what level do you put it? Charles I marked the page as 'Intermediate'. 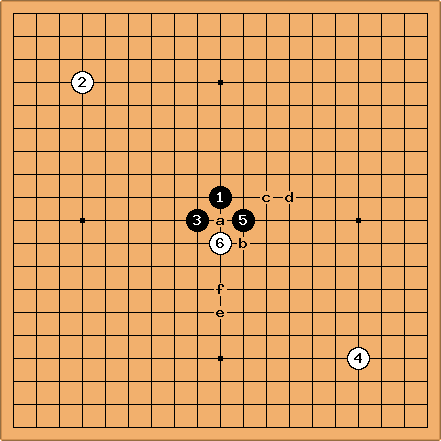 The proverb of course has exceptions: but a mid-kyu player will benefit from not handing the opponent ponnukis (particularly in this example position). It might help to dramatise the situation, to add and as forcing plays here: Black can hardly resist. tderz: at a is local but small and only another ko (hence should be played before ?). but in the end, it's just another (big) ko! It might also help to look at a sequence where Black builds up in the centre with . Here again the local tally ends up BB: but the and stones are now working to build on a large scale in the centre. Sebastian: Wait a minute - what happened to the white interloper? Charles This sequence is sente for Black, the previous result is sente for White. You are supposed to notice how 'forced down' Black is, in the first of the two diagrams. Kungfu: A comment on what Bill said above: You are right, but the truth is that ponnuki is worth 30 points, but White's framework is worth more especially since it's White's move. Yet I don't know if I would say the game wasn't even. Something like this, or a variation, is given in a book by Otake Hideo as being an even situation. It's Black's move now. It is given in his book "Opening Theory made Easy" under the section title "A ponnuki is worth 30 points". I have played and won about 40% of my games when using this "fuseki", against players of even strength. I actually reccomend it for Black to try this at least once, to help point out some faults in Black's whole board thinking against players of equal strength. 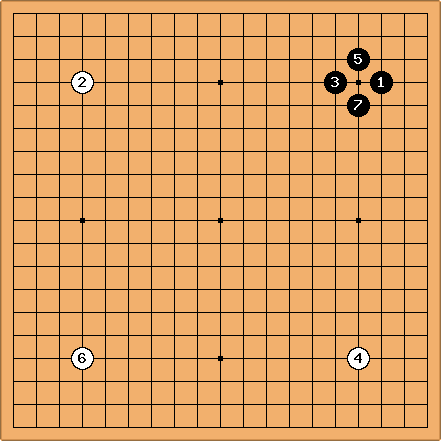 Bill: If you have lost about 60% of your games with that fuseki, then you have given up the value of almost one move. DaveSigaty: Note that ponnuki is not a shape in Japanese. 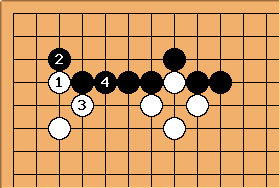 It is the act of capturing an enemy stone with four of your own ("pon" is the sound made by the final stone that removes - "nuki" - the enemy stone -- according to the Go glossary at the back of Yamabe's Gendai Joseki Jiten). As Bill mentioned above, the captured stone reduces the net stone count to just three. Similarly the tortoise shell shape is formed by only four stones net as long as two white stones are captured. Compare the following two continuations. If the second is equal then the first must be significantly to Black's advantage. Kungfu comments: Thanks, Dave. Very interesting point. However I view the result as not too much different, since in 1 above, White has sente, while in 2, Black has sente. Did White give up a stone for sente, and if so, is it worth the difference in board position in such a game? White passing, Black playing at with White to play next (= the situation in the previous diagram)? BTW, how about the actual diagram from Otake's book? What did he really say? lavalyn: Kikashi is a good thing and I think this shows fighting spirit  . Bill: I think the right term for this is approaching strong stones. It may show fighting spirit, but it is not a good thing. tderz: I find this peep against a ponuki-in-spe an excellent idea, cf. with dia . 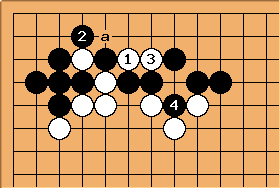 Of course Black will not defend with double empty triangle a, rather by and b to d or else. Therewith- except for a we will get the same position as in , where White played ridiculous. Bill: One problem with evaluating this position is that Black is already overconcentrated. Even if White stands better after , that does not make good. tderz: Overconcentration is an important issue, I agree. Questions for which professionals have been consulted (page title could be amended afterwards). Alex: Let me throw my voice behind Bill's. The move shown is certainly not kikashi, since there's no way White will respond. If there's anything to be said about it, it's that it grabs the shape point, but it still isn't a good move. In the context of a local battle in which both players have invested the same number of stones, a play on that point might be good, but since White has invested three stones here, and Black none, there's no way you can call White's shape good to begin with. What's the point of destroying an already bad shape? lavalyn:  As with this. White now has two cutting points a, b to deal with. tderz This has the appearance of beginner's Go from White's side. Black is a good move within the fundametals and follows the proverb "Add a 2nd stone, then sacrifice both". To actually force such a good move of the opponent is a strategy not abstract enough. Warp: How about two connected ponnukis? Alex:  These aren't really ponnukis, though. I mean, they are, but they aren't what the proverb is talking about. 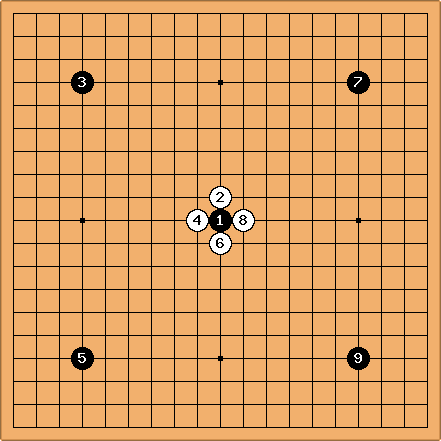 The proverb is talking about the influence value of a ponnuki facing an open space. Here, they are blocked in on the sides and have only a narrow opening to the centre. They're certainly thick territory, but I wouldn't equate them to 60 points by any means. John F. A little joke seems to allow a little pedantry - a handmade ponnuki can't exist. Nuki means capture. And actually ponnuki can be used of capturing more than one stone. It can be used for the turtleshell capture. It seems to be important to make this point because if you assume the capture of the enemy stone is actually a loss of a move by him, that stone alone is worth a lot more than 1 point. MrTenuki: I would put the 29-point claim in the same category as "capturing a ponnuki is worth about 39 points."